Hailey Tuck (vocals) + accompaniment. Those of us who saw Hailey Tuck with SSBB at Hoochie Coochie back in September 2016 will have fond memories of the bubbly, Parisian based, American singer and are sure to welcome this CD. It's unmistakeably Hailey although it must be said that, in a blindfold test, the listener, unfamiliar with Ms Tuck, could be forgiven for thinking it was Madeleine Peyroux or Melody Gardot. Two singers, incidentally, that Hailey is quoted as saying that she loves. Like so many singers, whether at local, national or international level, the repertoire here comprises mainly jazz influenced versions of contemporary pop songs which, let's face it was what Sinatra, Billie and Ella were singing in their early days. They did it well back then and Hailey does likewise here. Thus, we get: That Don't Make It Junk (Leonard Cohen); Cry to me (Bert Berns); Cactus Tree (Joni Mitchell); Some Other Time (Leonard Bernstein); Say You Don't Mind (Colin Blunstone); Alcohol (The Kinks); I Don't Care Much (John Kander); Underwear (Pulp); Junk (Paul McCartney) plus a couple of originals by Hailey - Last in Line, My Chemical Life and one real real oldie - Trouble in Mind by Richard M. Jones. Jazz historians may recall that Jones was the pianist to whom Joe 'King' Oliver, in an apocryphal story, turned to and said "Get in Bb" then walked to the door of the empty New Orleans saloon he was playing in and pointed his horn towards a joint on the opposite corner where rival trumpet player Freddy Keppard was drawing the crowds. Oliver put the trumpet to his lips and blew. Soon the other bar emptied and, after that, Oliver's gig was full every night. This was maybe 100 years ago and who would have guessed, least of all Jones himself, that his tune would, over the years, be recorded many times and that one of the best versions would be released by Sony Music on May 4, by a 27-year-old from Austin, Texas living in Paris! 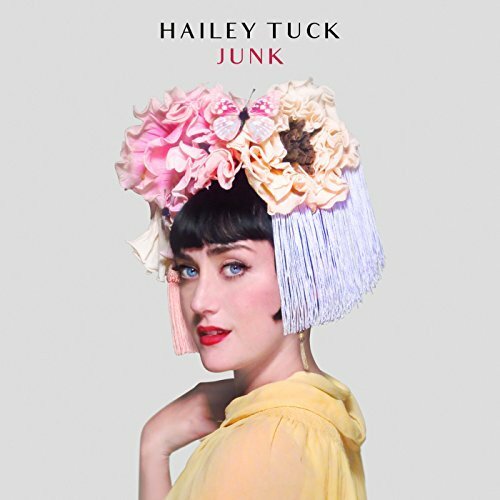 The album may be titled Junk but take it from me - it ain't! PS: Neither my promo copy or the blurb that came with it, had any info re the personnel and nor could I find out anything from Google so my apologies to the tasty backing band.